East Yorkshire Coaches driver Mark Higginbotham received a sparkling surprise when he made one of his regular trips to Bury's award-winning market. He was driving the 1,500th coach to have visited Bury Market in 2017, bringing visitors from Hull and the surrounding area. 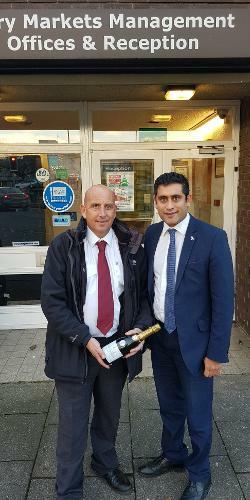 To mark the occasion, Mark was presented with a complimentary bottle of champagne by the leader of Bury Council, Councillor Rishi Shori. Councillor Shori said: "We're delighted that so many coach operators continue to visit our famous award-winning market. Mark is one of the many drivers who use the market's official drop-off and pick-up point, which is proving hugely popular both with coach drivers and passengers." Hull-based East Yorkshire Coaches visit the market every few months and tweeted on their website "We are regular visitors to Bury Market and are delighted to be the 1500th coach trip this year"
Picture: Council leader Rishi Shori presents a bottle of champagne to Mark Higginbotham of East Yorkshire Coaches.